But he’s not. Paul Revere is long dead. C’mon guys, get yourself together. I know the anticipation of this shorebird migration must be driving you nuts, too. It’s obviously rolling me off of the rocker. But no worries, that’s why I’m here. Ergo, it is my pleasure to announce: the shorebirds really are coming! So turn that frown upside down, and lean into your chair, you’re about to take a ride back in time of the elusive history of the Oregon coast to…yesterday. Oh, yesterday. Like many, it was crazy, full of random outings, chaotic research endeavors, and rapidfire admin projects. This was a particularly packed day; at 8am my roommates and I peeled out of bed and headed to Depoe Bay for a training on whales, then I rushed back home to jump into the field in my stubborn mission to find shorebirds, had an hour or so to coordinate logistics for a county-wide festival, and then jumped back into the field for a second attempt at shorebird spotting. For those who think that “kids” of my generation don’t want to work, take this brief picture of my internship as a glimpse into the things that we are willing to do simply for a feeling of purpose; it’s not an easy task to drag around a scope through mud, rain, bitter cold high winds, and trash for four hours a day, and then maintain the energy to complete three-four other projects. I am just one of many youngin’s happy and willing to shed sweat, blood, and tears just for a chance to shine. This is not a complaint, I’m extremely blessed and honored to have the opportunity, and can only hope that I deliver to and beyond the expectations put forth to me. What I hope to convey here is that it is important to provide a stepping stone for recent graduates to become qualified professionals within your field, because we’re ready and willing to make the leap, and keep on jumping until we’re ready to continue the legacy you leave behind. “What’s up?” My friend froze, anxious. “What?! ?” The poor girl was squirming from anticipation. If I were a comic book character, a big red exclamation point would have materialized above me and my head would have exploded from excitement. There’s no equivalent to making a discovery, no matter how small it may be. Yesterday I found that the peeps are arriving, and many more will soon be making their way. For now, we have Black-bellied plovers, Western sandpipers, and a Yellowlegs (I think Greater) claiming the Yaquina Bay. Just for fun, I also witnessed a Bald eagle stealing a fish from a gull in mid air and the gull, determined and touch beyond belief, coming back at the eagle for vengeance. Meanwhile, US Fish & Wildlife boating trips along the California shore have reported sightings of flocks of migrating birds coming up North. So rest assured, they are coming, they are coming strong. Until next time! Bird on. My First Encounters With Shorebirds And More.. I spotted my first shorebirds this weekend on my way back from an amazing getaway weekend camp trip with my supervisors, Erin and Melissa, and co-worker Jillian. 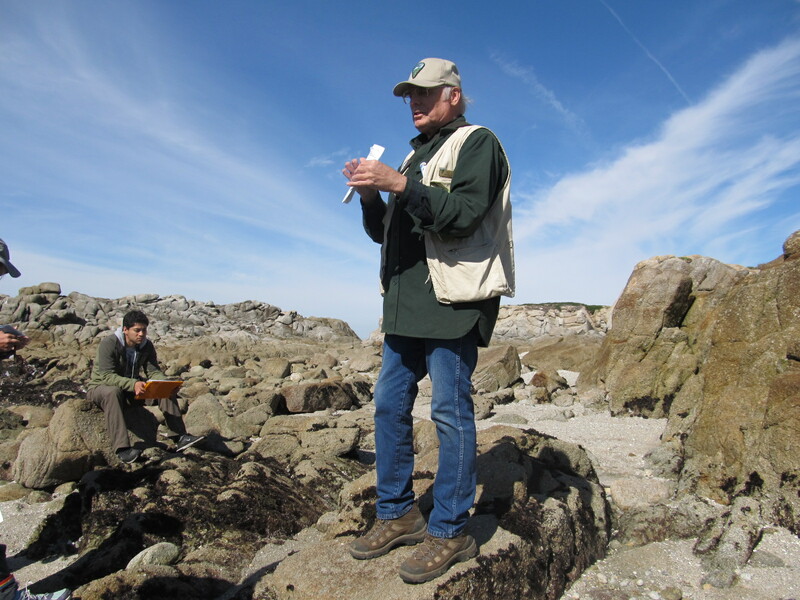 On our way back to town we stopped near small islands where we scanned the rocky shores for shorebirds from our boat. 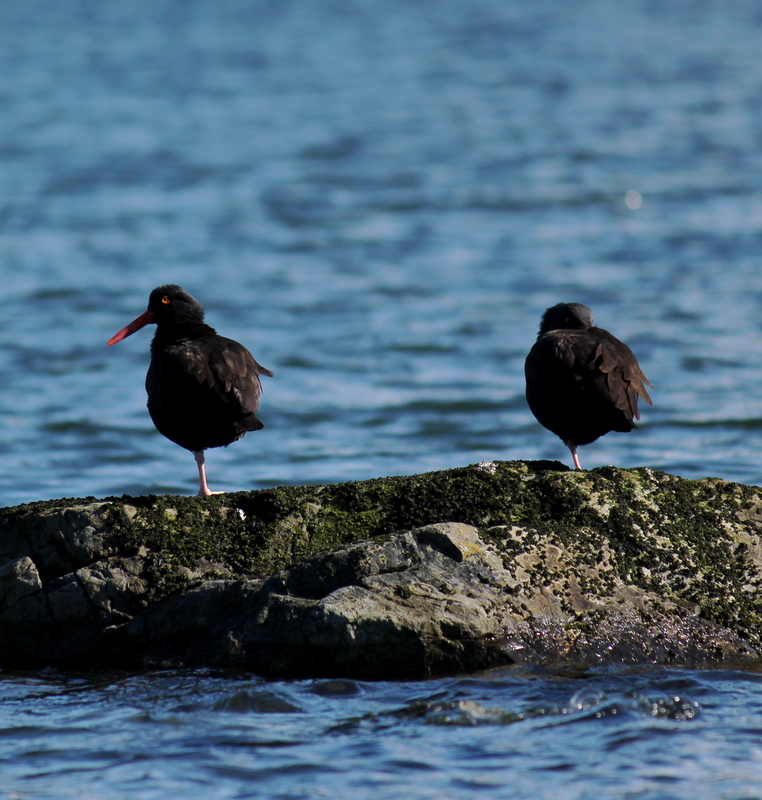 Right when we were ready to head home we spotted a pair of Black Oystercatchers! I was pretty excited! I got to drive the skiff (small boat) on our way home! It was a bit bumpy and wet, but I learned how to steer and follow the markers that tell you which direction to go to avoid hidden rocks or mudflats that can be hard to see during high-tide. During the work week, I helped collect pre-treatment data on a site that will be hydroaxed in hopes to promote moose habitat. Within a transect we recorded the tree nearest to our plot collecting tree species -number of stems, state of tree (dead/alive), height, and whether it had signs of browsing. Common tree species that we found were: alder, sitka spruce, mountain hemlock, and cottonwoods. 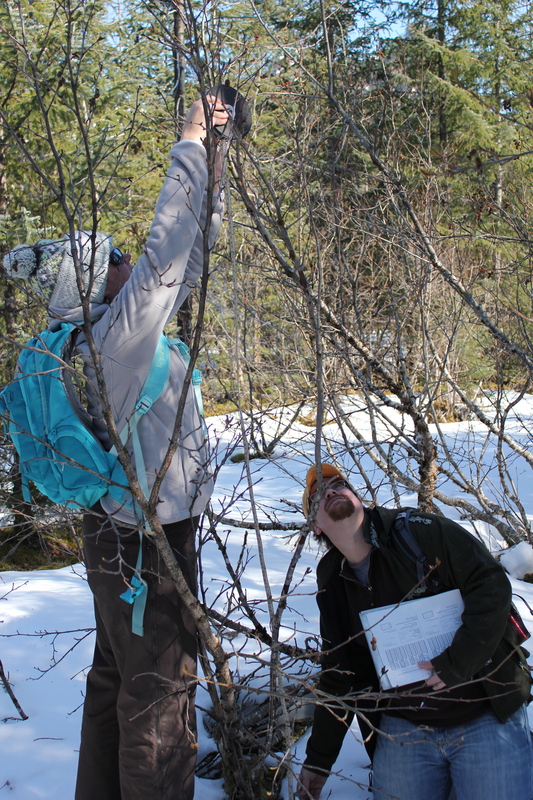 (In the picture below, Melissa and Mike are collecting tree height data). After work, my co-worker Milo Burcham, a wildlife biologist in charge of subsistence hunting with the Forest Service as well as a professional photographer. This week (1st week of April) Milo has been making trips to see the herring spawining event. Once a year, the herring come to Prince William Sound (PWS) to spawn, which attracts whales, porpoises, sea lions, sea birds, and humans! The herring were once abundant in PWS, but currently their numbers are nothing like they once were before the Exxon Valdez oil spill. Milo has been going out for many years now, and was going to take Michael who also is a professional photographer. As someone who enjoys photography, it was amazing to accompany professional photographers on such an amazing trip! 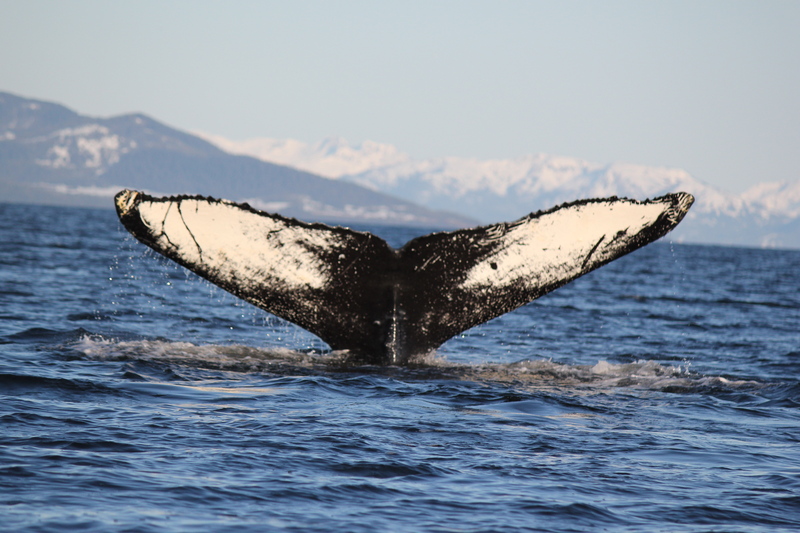 I had never witnessed humpback whales like I did this week, I could hear them! It is hard to put into words how I felt when I saw and heard them. I felt their energy, an ancestral connection (I’m not sure how else to explain it, but it was BEAUTIFUL).